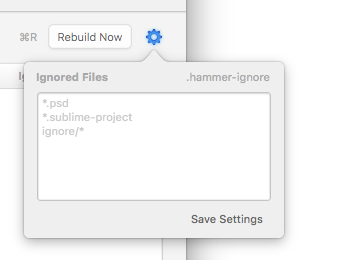 You may wish to have Hammer completely ignore a folder, some files or sore types of files. This is pretty common and it is highly recommended to ensure Hammer build performance, that you consider which files in your project should pass through the compilation process. It works in a very similar way to the .gitignore that you may have come across. For example, you wouldn't want any artwork files like .psd or .sketch, whole directories of dependency libraries, such as those in a node_modules directory. Using the Hammer Ignore is very easy, there's even a helpful UI in the Hammer app.